I was Skyping my parents back in December, and my mom told me that I’d be making dessert for the Christmas party with her extended family. My mind immediately went to this chocolate meringue cake, and both Mom and Dad were on board as soon as I described it. I don’t like the foamy meringues that you normally find on lemon meringue pie. The flavor is fine, but the texture is just nasty on my tongue. But the crispy-then-chewy meringues (like macarons!) or even the straight crunchy meringues (like the peppermint meringues from Trader Joe’s!) are different, and I love them. I thought that texture would be really interesting against the tender, moist cake and the fluffy, silky cream. I’ve never heard of anything like this, and bookmarked it maybe two minutes after I first saw the post on Serious Eats. I didn’t have buttermilk, so I just did 1/2 cup milk plus 1/2 T vinegar instead, then let that sit for a bit to curdle. I didn’t have any Dutch-process cocoa, so I just used the natural unsweetened one I had. No, it wouldn’t be as chocolatey as if I had Dutch, but when it’s rainy (and when you’re not used to rainy because it’s only rained maybe twice since the start of school) and cold I just don’t have much motivation to leave the house. I suggest you sift the dry ingredients. Normally I’m the one who disregards this and recommend that you don’t, but my cocoa was super lumpy this time and it took a long time to locate and de-lump each piece. I didn’t have two 8” springform pans, so I did two 9” round cake pans instead. I baked them for 10 minutes, since they were pretty thin cakes. As I went to test them for doneness, I pulled out the oven rack halfway. One of the cakes was jarred, and fell off the rack onto the oven door beneath. Luckily, it fell right side up, but the damage was done- the cake had shifted, wrinkling towards the edges and revealing its moist innards. On the brightside, the cake looked the right doneness. But the cake was super uneven and not smooth at all, so I tried to smoosh the cake towards the middle with a butter knife. Upon licking the butter knife, I was a bit puzzled- the cake wasn’t nearly as chocolatey and sweet as the batter had been. No matter, though, since there was still the meringue and cream and raspberries to add. I contemplated making a trifle instead, but ultimately decided that the meringue would (hopefully) hide the cake’s flaws. Sigh. The theory is that the meringues protect the cakes, so even though the cakes are in the oven for an hour, they don’t overbake. And if you notice, the cakes bake for 10 minutes alone; this is really short, as normally cupcakes (which are obviously smaller than an 9” round cake) go for double this long. I think this short time is meant to slightly underbake it to add extra insurance that the cakes come out moist and delicious (total guess though). I didn’t beat the meringue until it was no longer grainy. I was weary about overwhipping the meringue, so I just stopped. There was barely enough meringue to cover the cakes. I had to take some from the first cake and re-gift it to the other one. And another thing- the meringue was really hard to spread on the cakes. The cakes stuck to the meringue really badly, and I would inadvertently tear up parts of the cake while trying to smooth the meringue. The cake with the uneven surface ended up looking like it had a cookies and cream meringue. I baked them for 20 minutes, but the meringue was still too soft. I ended up baking them for 40 minutes, at which point I just pulled them, because I didn’t want to overdo the cake or the meringue. Gosh, this meringue just gave me so much trouble and grief. The raspberry sauce was pretty easy. I added a bit more berries and a bit less sugar. I shook the whipped cream; I poured the cream with a bit of sugar into a old pickle jar and shook it until it was firm. My arms burned and it took longer that I thought it should, but I got ‘er done. I like that the cream doesn’t deflate as easily/fast as it would if whipped by hand or machine. I baked the cakes the day before the party, then did the meringues the morning of the party. I went to hang out with Cleopatra and Yang, then came back to assemble everything in the afternoon. Only, it took us 30 minutes to get out of the mall parking lot because of all the Christmas shoppers out, and I got home at 5:45 not dressed for the party while the cake was separate, even though we were supposed to be at my aunt’s house at 5:30. Whoops. It became clear to me almost immediately after starting to assemble the cake that there’s a reason why Jones calls for springform pans. Because otherwise, the cakes and meringues will stick like a beeyotch to the pans, even if the non-stick pan is well-greased and there’s parchment covering 99% of the pan that touches cake. Mom got them out, with significant meringue cracking, but out of the pan nonetheless. The crappy layer was on the bottom, and I stuffed the crumbling meringue underneath it to help make it more level. The whipped cream was smeared on top, then drizzled with some raspberry sauce. The second layer was inverted onto another plate, then slid onto the whipped cream/raspberry sauce. Except the meringue was on the bottom touching all the cream and raspberries, and the whole layer ended up sliding a nice glob of cream off the cake and onto the plate. Sigh. At this point, it was looking very crumbly and depressing, so I whipped up the rest of the pint of cream with a touch of sugar and smeared that all on the cake so it was glossy white. 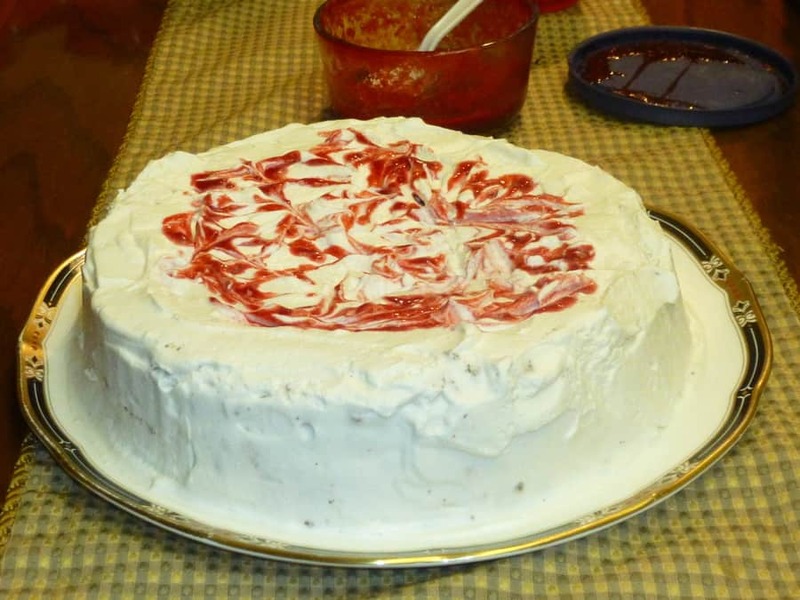 Mom and I tried to do a crumbcoat of whipped cream to help hold in all the crumbly cake and meringue bits, but we had no time to freeze the cake to help set that layer of cream, so the crumbcoat was fairly ineffective. But by the time it was done, the cake was looking snowy white, with only some chocolate crumbs lurking underneath and a slight crater in the center. Not bad, though. Huge shoutout to Mom for helping me save what could have been a nasty-looking cake. For transport, we stuck toothpicks in the cake and covered the whole shebang in copious amounts of foil. Mom insisted on bringing whipped cream to help fix any repairs that would come about from transporting, despite my reluctance (thank you again, Mom). Upon getting there, there was no space in the fridge for the cake, so I just stuck it in the garage, which was definitely cool enough. At dessert time, I discovered that the foil had stuck to parts of the cream and ripped it off, revealing the rich brown underneath. No matter; armed with a butterknife and whipped cream, I repaired the cake (almost) flawlessly, so smooth that Duff Goldman and Kerry Vincent would weep at the sight of it (hahaha). I tried to drizzle some of the raspberry sauce over in a swirly pattern, but it just kind of plopped onto the cake unattractively in dots. I’ve obviously been watching too many supernatural shows, since it was looking like droplets of blood on white snow. So, at the suggestion of two aunties, I used the butterknife to swirl the raspberry sauce into the cream. I didn’t decorate it with fresh raspberries (how unseasonal! ), but not too shabby for a girl who follows “delicious not gorgeous” and had two structurally unsound messes a couple hours earlier. The cake itself was very good. I loved how chocolatey and fudgy the cake was; I was worried about the doneness because the meringues were so thin and I had to cook them for so long, but the cake was still very moist. The crunch of the meringue got a bit lost, probably because half of it was softened by berries and cream, but when you did get a bite, it worked so well against the cake. The cream made everything better, and drizzling on extra raspberry sauce helped cut the sweetness of the meringue. Delicious certainly, all the more relieving after the trials and tribulations. Whisk the sugars, oil, egg, and vanilla until smooth. In a medium bowl, dissolve the coffee in 2 T boiling water, then stir in the buttermilk. In a small bowl, mix the dry ingredients. Add the wet and dry ingredients to the egg and sugar mixture. Gently mix until just incorporated. Smooth into two 8 or 9 inch greased and parchment-lined (bottom and collar) springform pans. Bake at 350F until a tester comes out with a few crumbs, 10 (9”) – 20 (8”) minutes. Cool completely, 30 minutes to 1 hour. The pans and cakes should feel cool to the touch. Add everything plus 1 T water to a small saucepan. Heat over low heat, stirring until the sugar has dissolved and the berries have started to release their juices. Increase heat and allow to come to a boil, stirring occasionally. Cook for 2 minutes over low heat, stirring occasionally. Remove from heat and cool completely. Strain. Whisk the egg whites until frothy, then beat until soft peaks form. Gradually add the sugar. Mix until stiff peaks form and you can’t feel any sugar when the meringue is rubbed between your fingers. Add the vanilla and whisk for a minute. Divide on top of the cakes. Use the back of a spoon to smooth the meringue in one of the pans and to swirl the meringue in the other pan to form peaks. Bake at 250F until dry and crisp but not browned, about 40 minutes. Meringue should sound hollow when tapped gently with a fingernail. Cool for 10 minutes in the pans. Carefully remove the pan collar and peel away the parchment from the sides of the cakes. Cool completely. Whip the cream and sugar until stiff peaks form. Place the cake layer with the flat meringue on a serving plate, meringue-side down. Peel off the parchment. Fill a pastry bag fitted with whipped cream and pipe small dollops around the outer edge of the cake. Spread the remaining cream onto the center of the cake and spread it to the inner edges of the dollops. Spoon 3 T raspberry sauce onto the center of the whipped cream. Smooth the top, out to the inner edges of the dollops. Peel the parchment off the second cake and arrange it, cake-side down, on top of the bottom layer. Press down lightly. You can leave as is, or if your layering skills are as bad as mine, frost the whole shebang in whipped cream. Drizzle with raspberry sauce and decorate with fresh raspberries right before serving.